Swirled in its simplest, healthiest and most natural form, FRAE yogurt comes fresh from the farm, with no additional additives or preservatives. The yogurt is packed full of live pro-biotics and active cultures and with just 83 calories in a small, FRAE is the perfect healthy snack. 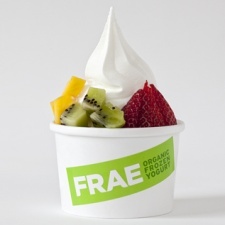 FRAE is a great place to relax for a well-deserved treat but is also a great snack to enjoy "on the run", with Notting Hill Gate tube station a mere 20 steps away. And it’s open till midnight. Well split me in two and cover me in cream, you'll go bananas for this place; it's not just a load of ol' waffle. Smooth, dense, creamy ice-cream with with lots of toppings? Chin chin to that?